The public playground in Bandon, a small town on the blustery coast of Oregon, has everything a kid could want. Swings and an orange, twisting slide, even a bright blue boat. But after the playground was installed in 2009, some mothers became concerned about the springy black stuff beneath their children’s feet. In addition to the new equipment, the playground was outfitted with the latest in safety surfacing: a pool of shredded rubber from old tires, also known as “rubber mulch,” which can cushion kids’ falls better than gravel or wood chips. Are Recycled Tires Used in Playgrounds A Health Risk? 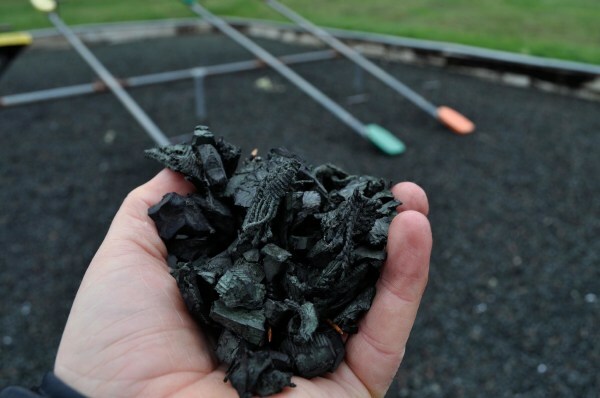 Farmer and a handful of other parents started to research rubber infill, the recycled crumbs and shreds of old tire that in various forms have become an increasingly popular option for cities, schools, and day cares looking for a safe play surface for kids. What they found, they said, launched them on a campaign to replace the rubber. The U.S. government, however, is sending parents like those in Bandon mixed messages about rubber mulch. The rubber mulch in Bandon is made of the same recycled tire rubber that is used as infill in crumb rubber artificial turf. A previous NBC News investigation raised questions about the safety of crumb rubber turf, which has been rolled out in thousands of U.S. parks, soccer fields and stadiums. More than two dozen studies have attempted to measure the potential health risks of crumb rubber surfaces. While many have found no negative health effects, some doctors and toxicologists believe these studies are limited and insufficient to establish conclusively that shredded rubber surfaces are safe. The difference between rubber mulch and crumb rubber artificial turf is that the federal government actively promotes the use of mulch — despite conflicting signals from the agencies charged with protecting children’s health and ensuring consumer product safety. The Environmental Protection Agency acknowledges that more studies of crumb rubber need to be done, and has retracted an earlier assurance that crumb rubber turf is safe. Both the EPA and the Consumer Product Safety Commission, however, recommend and promote rubber mulch. The EPA has worked with industry representatives and state officials to increase the use of tire mulch in playgrounds, and the CPSC recommends mulch in the “Bible” it provides to playground planners across the country. Proponents of rubber mulch say it protects kids from injuries, and that studies have proved crumb rubber to be safe. Made of fragments that can be peppercorn-sized or as big as pine mulch, the product is now showing up at day care centers, schools, even the playground at the White House. But as rubber infill moves from the soccer field to the playground, some are asking whether that same rubber presents a greater threat to young children, whose organs, muscles and nervous systems are still developing. “Little children should not be put in a situation where they’re forced to be in intimate contact with carcinogenic chemicals,” Dr. Landrigan added.